Apparently in Taos we’re hip on festivals–throughout the summer we have great music coming our way; in the Fall alone we have Taos Fall Arts Festival, The Paseo, the Wool Festival, the Storytelling Festival, and a ton of others throughout the year. I was talking last week with Leia Epstein during a KTAO Listen Up! 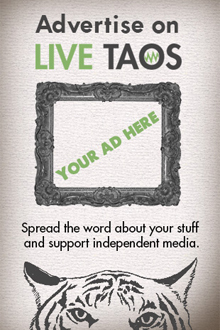 interview about how people can get involved with volunteer efforts for Taos’ street art festival, The Paseo. At one point in the conversation she asked me what kind of art I do. I told her I practice Yoga and said that for those who feel committed to it, Yoga is an art, one in which our body is the medium to connecting with our creative source and a mode for our expression. At first, Yoga draws a person inward, slowly deconstructing pre-conceived and ingrained mental patterns about the world and our self in it, to an understanding that moves away from an analytical approach and into a more intuitive perspective, one that encourages us to see what might be really going on within ourselves and the world around us. The tools a creative Yogi uses are the restrictive nature of matter and time. When bringing attention to form, technique within asana, vinyasa, and breath is refined. We start to see how whatever is not conscious within us is carried in our bodies, affecting and limiting our range for feeling and thinking. As the layers of false truths accumulated by years of conditioned living disintegrate, it becomes clear that the mind is by its own nature free and creative. Practice is meant to break down conditional thinking–our social, familial, and gender-based identities–and by virtue of that, it is a profound act of political and social activism. At some point the intensive svadhyaya, self-study, of listening to your own breath and watching without objectifying the hows and whys of your body turns outward to watch and flow with the rest of the world. It sounds all very groovy because it is, but also, it’s considered the foundation of really listening to someone else. Since it first came to the West about one hundred years ago, Yoga has mostly been an entity alone in our culture’s framework. It’s gained a muddy association with religion in an environment that encourages polarities of religion and science. As it’s become more popular here in the last 20 years, much of the intellectualism that has driven a philosophy of human mind and livelihood for thousands of years has been watered-down to a loose appreciation for what it means to feel good and be happy with yourself. Yoga is a deep healing tool that aligns a person with their true Self, something undefined by anyone or anything other than that individual. This is what makes it art, and because it accommodates itself to what the larger consciousness of groups of people are thinking about at any time to uncover deeper reason behind why we do what we do, it’s a science. Last week, while I walked around town with The Paseo on my mind, I was fantasizing about a Yoga street art festival. It would be a thing where not only Yoga could be part of public space; it would be represented alongside other art and music, lectures and workshops. We Yogis like that place where two apparently different things collide–it’s the definition of Yoga, to yoke together. The open-minded and adaptive intellectualism of Yoga finds common ground with gnana yogis (wisdom seekers), bhakti yogis, (devotional, heart-centered seekers), and karma yogis (activists, artists, healers). It’s about time, I was thinking to myself, that Yoga is recognized as an art form, illustrated by an unbroken thread of thousands-years old philosophy, with a very real potentiality for healing individuals and communitites. How cool it has been, then, to discover that a group of people are already on it, inaugurating UNIFY FEST in Santa Fe this very weekend. 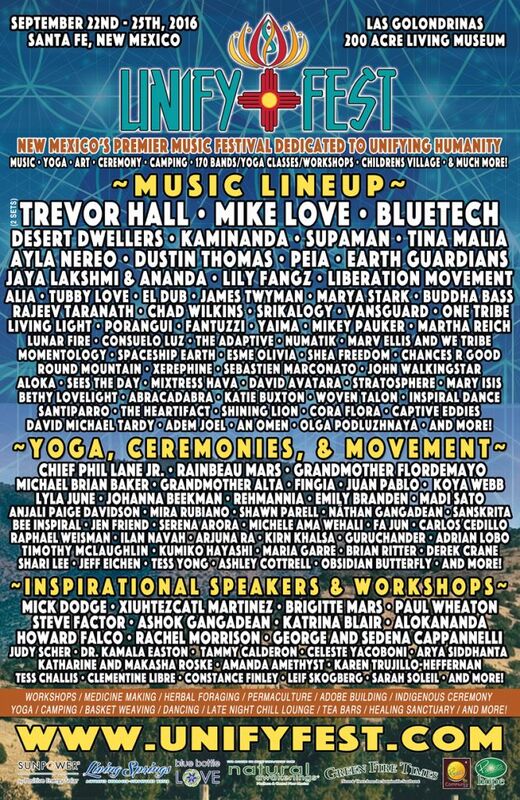 UNIFY FEST is a festival of celebration around music, health, Yoga, and Indigenous cultural experiences, at Los Golondrinas in Santa Fe, September 22-25, 2016. UNIFY FEST is also hosting teachers, speakers, ceremonialists, and indigenous elders. Ashok Gangadean, Professor and Chair of Philosophy at Haverford College, as well as Founder-Director of the Global Dialogue Institute and author of The Awakening of the Global Mind will be presenting. Native American environmental youth activist from Boulder, CO, Xiuhtezcatl Martinez, who has given speeches internationally, including to the UN, will also be presenting. They will be offering “experiences in Yoga, movement, breath work, Tai Chi, Qi Gong, sustainable design, medicine making, permaculture…” And there will be so much more.